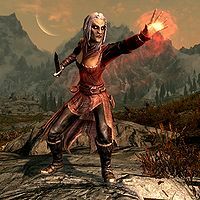 The Vampire Assassin is a female vampire that can be randomly encountered if you have completed the quest A New Order for the Dawnguard. She carries the assassin's writ and drops vampire dust and some random potions when she dies. This page was last modified on 17 October 2012, at 16:53.